During the barn's open house, the coffee table received so much attention. Before I go on to show another room, I thought I'd share how my mother whipped up this table during the day prior to the party. She built her coffee table in such a short time because she had all of her supplies at hand. It might take a little longer if you have to hunt down a crate and have your glass custom cut, but the satisfaction of making something on your own will remain. As always, we love the juxtaposition of old and new. Industrial casters seem to lend themselves to crates very naturally. We've been very inspired by Baileys. They do wonders with crates. Our crate was sturdy, but the wood was too thin for inserting large casters. To give it some heft, my mother attached two one inch slats across the width of the crate. Next, she drilled four holes for the casters, which slipped right in. She topped it off with a thick piece of vintage glass that had belonged to my friend's grandmother. That's it! You can also purchase a custom cut piece of glass from your local glass shop. Casters can be found at most home builder stores. We also love the selection at the Tractor Supply Company. I'd love to hear what you've created with something old and something new. What a brilliant project! I'll have to be on the lookout for a vintage crate. And I can't believe that glass top is vintage--it's in perfect shape! I've finally had time to take the tour! All I can say is Wow, the whole of it is amazing and compelling and awesome. 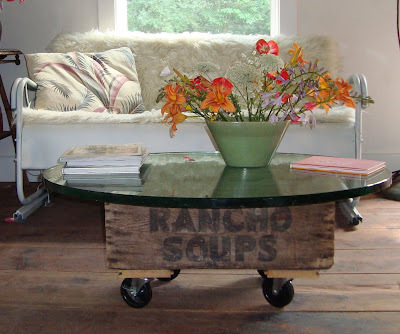 And this coffee table is just another example of the creativity that abounds in there! what a cool project--it looks great, you diy'ers, you! Hi! I made a coffee table for our porch 11 years ago from my parents old wooden kitchen door. My husband cut the top part of the door off which held the glass window. We left all of the hardware on it except for the door knobs and added legs. Then I painted it bright red. The paint is faded and chippy now, but no one else has a table like it and it still looks great! Found you through Design Sponge and omg...this table is great!! LOVE this! I linked it to my coffee tables project post too, for inspiration!!! I found your blog by linking over from "Inspire Me Heather" for coffee tables. LOVE your coffee table, thanks for sharing the "how to". I noticed that this was posted back in 2008 and now folks who maybe weren't even blogging back then (like me) get to see it. It also gives me hope that some of my posts that don't get many views, might someday get more in the future.